With strong demand for summer pasture, producers are looking for alternatives to produce forage for grazing. Cattle can be grazed from mid-spring through the fall using well-planned, annual forage systems. This involves timely planting of cool- and warm-season annual forages. 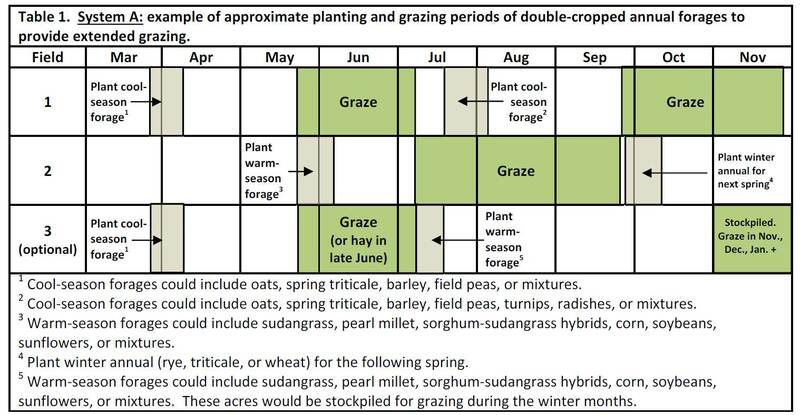 These systems typically involve at least two fields and one or two plantings per field during the year (see Table 1 below for a suggested timeline). This webinar reviews some important planning suggestions including types of forages to plant, timing of planting, determining acres needed, and stocking rates. Additional information is also available in the "Planning Annual Forage Systems" article (March 2016).